In 1991, an English rock band named Oasis was formed in Manchester. The Guinness Book Of Hit Singles And Albums declared Oasis as the “Most Successful Act of the Last Decade in the UK” with more than 50 million albums sold worldwide and also have had eight Number One singles in the UK. Oasis is led by lead guitarist and primary songwriter, Noel Gallagher, and his younger brother, Liam Gallagher, lead vocalist and songwriter. Liam and Noel Gallagher are the only two original band members who stand in the band until now. The present lineup is encompassed with bass guitarist Andy Bell, rhythm/lead guitarist Gem Archer and as-yet unofficial drummer Zak Starkey, son of former Beatle Ringo Starr. Oasis’s debut live show occurred in August 1991 at the Boardwalk club in Manchester. Firstly, only one Gallagher brother, Liam, appeared in the band but a few months later Noel Gallagher, the older brother, also joined the band as a band’s sole songwriter and leader. The other original band members are also included Paul Arthurs, Paul McGuigan and Tony McCarroll. The band’s big break came on May 31 when they were spotted by Creation Records co-owner Alan McGee who invited them to play a gig at King Tut’s Wah Wah Hut in Glasgow, Scotland. After the show, McGee was so impressed by their performance and unhesitatingly signed the band to Creation Records four days later. “Supersonic”, their first single, was released in April 1994 reaching number 31 in the charts and their third single, “Live Forever”, was the first single to enter the Top 10 of the UK charts. In September 1994, after troubles with recording and mixing sessions, their debut album, “Definitely Maybe”, was released and rapidly entered the charts at number one and at the time becoming the fastest selling debut album in the UK. Therefore, “Definitely Maybe” was given a Mercury Prize – nominated debut album, the prize which is awarded for the best album from the United Kingdom or Republic of Ireland. In April 1995, the first single from their second album, “Some Might Say”, entered number 1 in the UK charts, and at the same time, drummer Tony McCarroll was ousted from the band, replaced by Londoner Alan White. 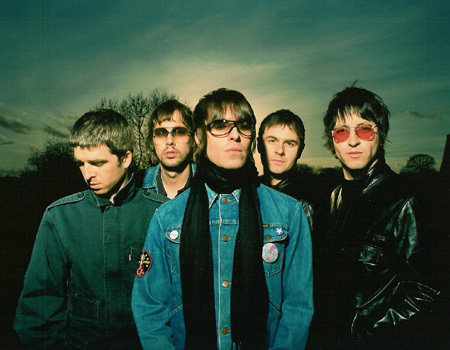 At the height of their reputation, Be Here Now, Oasis’ third album which released in 1997, reached number 1 in the UK charts, number 2 in the U.S. and also became the fastest-selling album in chart history. Almost half a million copies were sold on the first day and about 700,000 copies in its first week. In November 2006, a “best of” album entitled “Stop the Clocks” was released and suddenly received great attention, especially in the UK where more than one million records were sold in three months. Oasis received a BRIT Award, the annual United Kingdom pop music awards, in February 2007 for their outstanding contribution to music. And now, Oasis is contemplating on their new album which is expected to be released in 2008. Welcome to the world of Oasis! This is an ideal place for everyone who thirst for the information of the famous English rock band, Oasis. Here, you can find a bulk of stories about Oasis such as a brief history of the band, current & past band members, albums, band’s news, scheduled tours, etc. Furthermore, This site also provides links and blogs which you can find other interesting information and stories about the band. DVD, books and videos about Oasis are also available here.